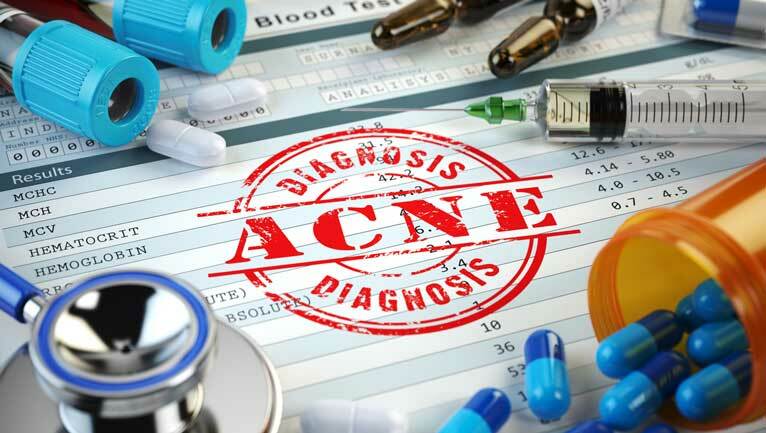 There are many things that can cause a sudden outbreak of acne like changes in temperature, taking antibiotics, and eating foods like dark chocolate. A splash of alcohol on your face to disinfect acne may actually increase the production of skin oils. Eating dark chocolate can cause acne breakouts of 4 to 80 pimples in less than a week. Health conditions that increase testosterone production in women can trigger acne. Testosterone injections in men can trigger a serious form of acne known as acne fulminans. Sudden changes in temperature can trigger rosacea. Oral antibiotics can trigger acne by killing bacteria in the colon that help keep inflammation in check all over the body. Scrubbing the skin (which is not the same thing as using a skin scrub) can trigger acne. 1. Acne breakouts can be triggered by rubbing alcohol. Rubbing alcohol, also known by its chemical name, isopropyl alcohol, is not unusual in many acne products. It cools the skin as it evaporates, and it leaves the skin feeling tingly. Many acne care products add alcohol to make it feel as if they cause a “skin healing action,” but the action of alcohol on the skin is usually anything but healing. Alcohol dries out the skin and kills skin cells in the delicate linings of pores. When the skin senses destruction of healthy tissue, it protects itself—by making more sebum. This can set off a cycle of cleansing and excess oil production. You keep using the product, but it never does you any good. 2. Acne breakouts can be triggered by eating dark chocolate. It used to be accepted as commonsensical truth that chocolate makes your skin break out. Then commentators who didn’t entirely understand the issue reasoned that chocolate is rich in the amino acid arginine and that arginine activates herpesviruses, so what was really happening was the chocolate makes cold sores break out. Chocolate actually does make cold sores break out, but a recent study at the University of Miami found that it makes pimples break out, too. As many as 80 pimples can break out after eating just three dark chocolate bars. The offending ingredient seems to be theobromine, which is also the constituent of chocolate that makes it, well, yummy. Dark chocolate is more of a problem than milk chocolate. 3. Acne breakouts can be triggered by hormonal changes, especially those related to testosterone. Millions of women have a condition known as polycystic ovarian syndrome, or PCOS. This health issue may or may not involve cysts in the ovaries but it always involves a hormonal imbalance involving over-production of testosterone by the ovaries. Excess testosterone makes the skin more sensitive to stress chemicals, which in turn increase skin oil production and create allergy-like symptoms in the skin even when there is no allergen to activate the allergy. In men, testosterone injections sometimes cause a dangerous condition called acne fulminans, involving not just the skin but also joints. In both cases, however, the secret to controlling acne is lowering testosterone. Usually women with PCOS respond to low-calorie diets, and men with acne fulminans begin to recover when they stop using steroids and testosterone. 4. Acne breakouts can be triggered by sudden changes in temperature. Covering your face when you go out in the cold, so it will not rewarm too quickly when you come back in. Avoiding hot drinks and spicy foods, especially hot peppers, which activate a nerve at either side of the face that affects blood vessels. Never, ever rubbing the skin with ice. Avoiding drafts from either heaters or air conditioners. 5. Acne breakouts can occur after physically scrubbing the skin. The kind of “scrub” that is used to treat acne does not involve mechanically rubbing or scrubbing the skin. An acne scrub refers to the use of a product that removes dead skin or particles of hardened oil from the skin by a very mild abrasive action—usually without the helping of working the product into the skin. The reason not to scrub the skin with a washcloth, or, even worse, a brush, is that the skin protects itself by creating more sebum, and in turn the newly created sebum clogs pores. Scrubbing blemish-free skin has the effect of creating new blemishes. 6. Acne breakouts can occur after stress. When we experience physical or emotional stress, the brain releases corticotrophin stimulating hormone, which instructs the adrenal glands to make adrenalin. The skin can also release corticotrophin stimulating hormone, causing it to release histamine, the same chemical released in an allergy attack. This reddens and irritates the skin, highlighting existing pimples, and blocking previously open pores. 7. Acne breakouts can be triggered by yeast infections. Yeast infections sensitize the immune system. Sometimes the immune system is activated by a yeast infection to attack skin on the back, chest, and shoulder with tiny red blotches of psoriatic acne, also known as guttate psoriasis. Acne bacteria are not involved in the formation of these pimples. They are solely due to the action of the immune system in the skin. Treatment for this kind of acne usually requires use of steroids, or waiting a considerable time for the skin to heal itself. 8. Acne breakouts can be triggered by either smoking or drinking. Chinese researchers have found that Chinese teens, in particular, are more likely to have acne breakouts after a weekend of drinking and smoking. Whether these findings are also valid for teens with other skin types remains to be scientifically determined, but it seems likely. The bacterium Helicobacter pylori is implicated as one of the causes of both stomach ulcers and the form of acne known as rosacea. Treating the stomach infection often clears up acne. You are most likely to be exposed to this bacterium if you have drunk tap water in Latin America, especially Nicaragua. 10. Acne can caused by oral antibiotic treatment. Sometimes doctors prescribe oral antibiotics to treat acne. Ironically, these treatments sometimes make acne worse. The colon is home for helpful, symbiotic bacteria like Lactobacillus. These bacteria interact with the immune system to reduce the production of inflammatory chemicals, keeping the skin clear. Antibiotics taken to kill acne bacteria from the inside out have the undesirable side effect of killing helpful bacteria in the gut, and increasing skin inflammation at the same time they control skin infection.